Did Climate Inspire The Birth Of A Monster? Writers can be inspired by their surroundings — but Indonesian volcanoes? Researchers say Mary Shelley's Frankenstein may have been inspired by an icy, dark summer caused by Mount Tambora's eruption. Dr. Frankenstein, played by Tony Silver (left), holds the hand of his monster, played by Brian Hill, during a performance for Halloween in in the U.K. If you ask people about weather and Frankenstein, they usually think of one thing: the scenes from the classic horror films, which show Victor Frankenstein in a storm, using lightning bolts to jumpstart his creation as he cries "It's alive! It's alive!" You won't find that dramatic scene in Mary Shelley's book, according to Bill Phillips, who teaches literature at the University of Barcelona in Spain. Although Shelley wrote that the scientist infused the lifeless being with a spark of being," Phillips says that "there's no lightning or anything. It's not as spectacular as it is in the films." Still, Phillips thinks that the movies do get the right idea in a larger sense. He and other scholars think that extreme weather was involved in the birth of the creature — just not in the way we usually think. That's because Shelley wrote her book during a period of extremely freaky weather in Europe and North America. Mary Wollstonecraft Shelley (1797 - 1851). 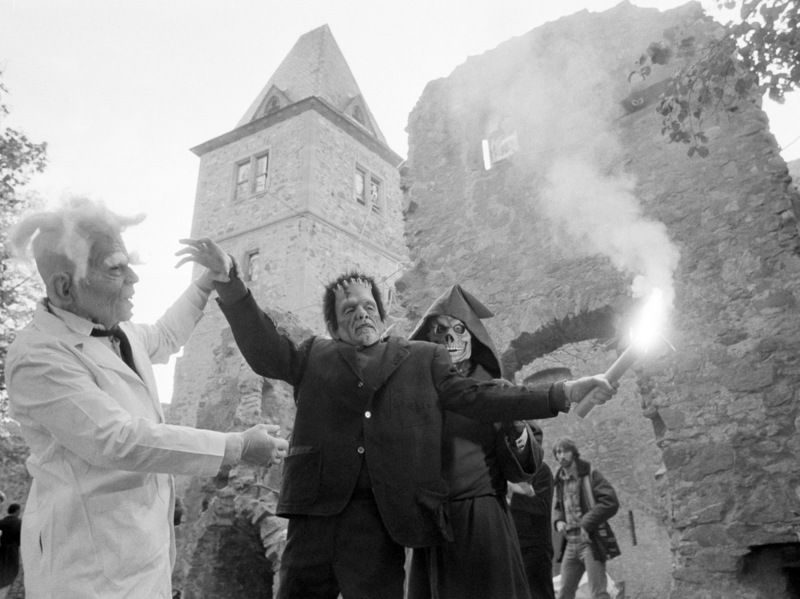 Most people look at Frankenstein as a simple tale of arrogant science running amuck. But it can also be viewed as an example of how climate change can have a profound effect on artists. Mary Shelley started writing the book in 1816, when she was just a teenager. It wasn't too long after she had run off with the married poet Percy Shelley. They went to Switzerland for a summer vacation. "I think the plan had been to be tourists and go climbing mountains and things like that," Phillips says. "And they couldn't, because of the weather." The weather was beyond bad. It was unbelievable. "And we know why it was bad weather," Phillips says. "It was because of this volcano." A volcano named Mount Tambora had erupted in what is now known as Indonesia, sending vast plumes of dust into the atmosphere. Starting in the spring of 1816, people in Europe and North America saw skies that were strange, even alarming. That year came to be known as "The Year Without a Summer," or "eighteen hundred and froze to death." "It actually really was dark, for days if not weeks on end," Phillips says. "It was one of the coldest periods in modern history, so it was extremely serious." He says that in many places, the harvests failed for three consecutive years. There were food riots, and many people were dying from starvation. As all this chaos began, Mary Shelley was hanging out at the Villa Diodati by Lake Geneva, reading ghost stories with her friends, including Lord Byron. "And then I think it was Byron who came up with the idea that they should actually write a ghost story themselves," Phillips says. 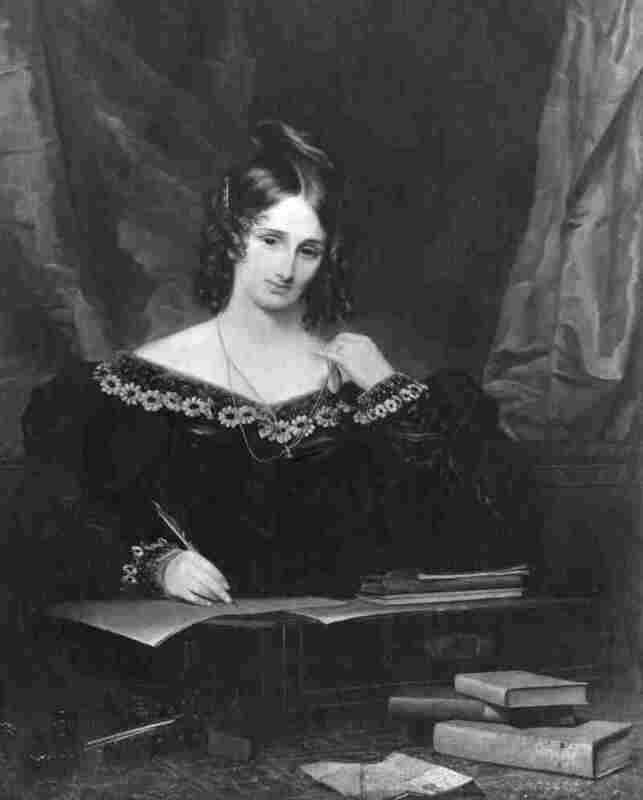 Shelley started work on Frankenstein; she eventually published it two years later. Weather seems to show up on almost every page. Frankenstein wasn't the only story inspired by unusual weather. See what other works of literature were influenced by historic weather conditions. In one passage, Victor Frankenstein describes how he walked through a storm at night: "Vivid flashes of lightning dazzled my eyes, illuminating the lake, making it appear like a vast sheet of fire; then for an instant everything seemed of a pitchy darkness, until the eye recovered itself from the preceding flash." Scenes like this one seem to have come from letters Shelley wrote about the weather she was experiencing at the time. Here's a letter to her sister: "One night we enjoyed a finer storm than I had ever before beheld. The lake was lit up — the pines on Jura made visible and all the scene illuminated for an instant, when a pitchy blackness succeeded, and the thunder came in frightful bursts over our heads amid the darkness." The creature in Frankenstein is strongly associated with these thunderstorms. And, Bill Phillips says, the creature is also linked to cold throughout the novel. "He invariably meets his creator at the tops of mountains, in icy caves," he says. "Then at the end of the novel, they go into the Arctic Ocean and we're led to believe that they die as they drift off on an ice floe." Now, maybe Mary Shelley would have sent her creature to the Arctic no matter what kind of weather was outside her window. But John Clubbe doesn't think so. An emeritus professor of English at the University of Kentucky, he has written about Frankenstein's link to The Year Without a Summer. He points out that in 1816, it was snowing in July. "Seeing this world of ice and snow at close hand, when you should be seeing green fields and trees in bloom, this is so unusual," Clubbe says. "It has to affect the way you feel and want to write." Frankenstein suggests that, as our climate changes, our literature and poetry might change, too. Plus, Clubbe says, at a time when many people are concerned about greenhouse gases, Frankenstein is a very appropriate cautionary tale about how to deal with unintended consequences. "All the improvements that make life easier and better and so forth, they resulted in this oncoming crisis called global warming, which is a potentially monstrous scenario that looms ahead for all of us," Clubbe says. He says that if we just ignore this problem, like Victor Frankenstein neglected his creation, the weather could someday start to seem as strange as it did in 1816. Gay's satirical three-book poem is a guide through the streets of London — including advice on surviving falling masonry and mud splashes. The poem also includes an account of a winter so cold that the Thames River froze solid. The river froze often, including in 1716, the year the poem was published. Fairs were organized to celebrate the event. The icy river also appears in Virginia Woolf's novel, Orlando, written in 1928. According to UNC-Chapel Hill literature professor James Thompson, unusual weather in the early modern period — heavy storms or high winds that blew down trees — was usually reported in terms of portent, or some mark of God's disfavor. The changing Weather certain Signs reveal. And all around the grateful Warmth ascends. After running away to elope with her cousin's fiance, Maggie Tulliver sees the error of her ways and returns to life in exile in the fictional town of St.Oggs, losing contact with her extended family and her best friend-like brother, Tom. Her brief seclusion ends when the Floss River floods. After struggling through the waters in a boat to find Tom, she sets out with him to rescue family members. Just after brother and sister are reunited, their boat capsizes and the two drown in an embrace. Some say George Eliot's inspiration was the flooding of the Trent River at Gainsborough in Lincolnshire, England. In the second week of September, Maggie was again sitting in her lonely room, battling with the old shadowy enemies that were forever slain and rising again. It was past midnight, and the rain was beating heavily against the window, driven with fitful force by the rushing, loud-moaning wind. For the day after Lucy's visit there had been a sudden change in the weather; the heat and drought had given way to cold variable winds, and heavy falls of rain at intervals; and she had been forbidden to risk the contemplated journey until the weather should become more settled. In the counties higher up the Floss the rains had been continuous, and the completion of the harvest had been arrested. And now, for the last two days, the rains on this lower course of the river had been incessant, so that the old men had shaken their heads and talked of sixty years ago, when the same sort of weather, happening about the equinox, brought on the great floods, which swept the bridge away, and reduced the town to great misery. Lord Byron found inspiration in the same icy summer that influenced Mary Shelly's Frankenstein. Affected by the unusual weather caused by the eruption of Mount Tambora in modern-day Indonesia one year earlier, the poet reflects the mood caused by the ash cast into the atmosphere, thick enough to hide the sun and cause abnormal weather patterns across America and northern Europe. Due to the abnormally cold conditions of May 1816, the period was known as the "Year Without a Summer." The Joads, a sharecropper family, are forced off their Oklahoma plot because of extreme drought and a changing agricultural industry during the 1930s Dust Bowl era. More promising weather conditions in the orchards of the West urge the Joads – and thousands of others — on a migrant journey to California. The last rains lifted the corn quickly and scattered weed colonies and grass along the sides of the roads so that the gray country and the dark red country began to disappear under a green cover. In the last part of May the sky grew pale and the clouds that had hung in high puffs for so long in the spring were dissipated. The sun flared down on the growing corn day after day until a line of brown spread along the edge of each green bayonet. The clouds appeared, and went away, and in a while they did not try any more. The weeds grew darker green to protect themselves, and they did not spread any more. The surface of the earth crusted, a thin hard crust, and as the sky became pale, so the earth became pale, pink in the red country and white in the gray country. Contributions from: Nathan Hultman, assistant professor of Science, Technology and International Affairs, Georgetown University; James Thompson, professor & chairman, Department of English and Comparative Literature, UNC-Chapel Hill. — "Trinity and All Saints, Leeds" in the Mill on the Floss entry of the Literary Encyclopedia by Nathan Uglow, June 2002. — "River Imagery as a Means of Foreshadowing in The Mill on the Floss" in Modern Language Notes by Larry Rubin, January 1956. — "The Thames," a historical section of the Jane Austen Society of Australia Web site, by Dennis Nutt, January 2004.